I've decided to do a new feature here on the blog. All of my previous posts seem to be me complaining about something, so I'm hoping to make this a little lighter. It's the "Freak of the Week." I'll write up something about one of my favorite "freaky" wrestlers each Friday. I chose to Kamala the Ugandan Giant for my inaugural freak post. After much thought, I think Kamala is probably my favorite gimmick. He played the role so well. As you can clearly see by the photo above, he is not the savage beast he played in the ring. My first memory of Kamala goes back to the World Class Championship Wrestling days. It was sometime in 1984. World Class had produced some vignettes of Kamala "on location" in his homeland of Uganda. Being new to wrestling, I took it all in and believed everything I was seeing. Of course I was 11 years old back then. Kamala had some epic battles while in WCCW. He battled the faces of the company, the Von Erich brothers. I still remember "marking out" when Kerry body slammed the giant. Kamala also had some epic battles with Bruiser Brody. They would slug it out like a couple of drunken sailors in a bar. As I was preparing for this post, I came across a Youtube video of Kamala scooping up Andre the Giant and slamming him to the mat. I had heard this had happened, but until now had never seen it. So long before Hulkamania ran wild on the Giant, Kamala did. Speaking of Hulk Hogan, Kamala had a run with him too during one of his tenures in the WWF. If I remember correctly, the two had just battled it out in Madison Square Garden when Andre confronted Hogan for one of the first times before his official heel turn. Another epic feud for the beast was with the Undertaker. The two of them fought it out in a coffin match at the 1992 Survivor Series, which I have on VHS tape still. Kamala came up short that night. It wasn't long after that that the character took a turn that I wasn't really fond of. 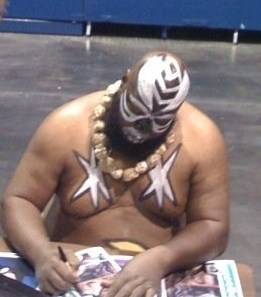 The powers that be in the WWF decided it was time for Kamala to be a fan favorite. For more than a decade this guy was a brute and a savage, delivering his big splash to opponents and rolling them out of the ring. Now, he was a kinder, gentler fellow. At least they gave him a manager (Slick) and didn't have him talk. That would have killed the gimmick totally. Kamala also had a run in WCW in the Dungeon of Doom, once again a heel. He's made a few appearances on WWE TV in the last few years, putting over guys like Randy Orton and Umaga. The last time I saw Kamala in person was at the ROH show in Houston during Wrestlemania 25 weekend in 2009. He didn't really wrestle that night, but he came out to the ring in his full gear: the paint face, two stars on his chest, half moon on his belly, and that little leopard print "skit". I know it's not a kilt. Ha. After the show, we saw him sitting in the lobby of the facility, fully clothed and no makeup. It was strange to think Kamala is really a person (Jim Harris) and not the beast he plays on TV. If by chance he reads this or has his man Friday do it for him, I have nothing but respect for you Kamala. This of course is a quick few at his career. For more on Kamala, Google him. What the Hell (in a Cell)? Diva's Champion: Good or Bad? It's Real to Me, Dammit!